Diffusion MRI is a well-known and widely accepted magnetic resonance imaging (MRI) methodology which generates in vivo images of biological tissues weighted with the local microstructural characteristics of water diffusion, providing an effective way of visualizing functional connectivities in the nervous system. This relatively new and powerful imaging technology gives us further tools to study variations and development of normal brain anatomy, and diagnose disruption to the white matter in neurological disease or psychiatric disorder. Diffusion MRI helps us to better understand the structural organization of the brain through an identification of the neural connectivity patterns with the help of Diffusion Tensor Imaging and High Angular Resolution Diffusion Imaging. Diffusion-weighted magnetic resonance (MR) imaging, boosted by established successes in clinical neurodiagnostics and powerful new applications for studying the anatomy of the brain in vivo, has been an important area of research in the past decade. Current clinical applications are based on many different types of contrast, such as contrast in relaxation times for T1- or T2-weighted MR imaging, in time of flight for MR angiography, in blood oxygen level dependency for functional MR imaging, and in diffusion for apparent diffusion coefficient (ADC) imaging. Even more highly developed technologies than these are in use today for the study of brain connectivity and neural fiber tract anatomy. A recent advance in MRI known as Diffusion MRI looks at the random motion of water particles in the body. This is particularly interesting when taking images of the brain, because water tends to move more along the directions of the connections inside the brain. These connections in the brain, known as "white matter", are crucial to keeping the brain working correctly. They are the pathways that carry information from one part of the brain to another, and if they are damaged, the brain cannot perform even the most simple tasks. 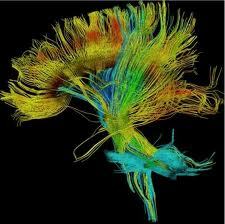 Diffusion MRI is unique in its ability to study these pathways, based on how water flows along them. There are many diseases that affect the white matter in the brain, and it can be very hard to understand exactly how the disease attacks the white matter, to predict how the disease will develop in a particular person, and to decide what the right treatment is for that person. Fortunately, because diffusion MRI is sensitive to changes in white matter, it is an excellent way of finding out about these diseases. For example, if the disease is breaking down the pathways, water stops moving along them, or leaks out of them, and diffusion MRI pinpoints this for diagnostic purposes.